Ban Izakaya is a few blocks away from the Yutenji station. As you get close, you get a portent of what is to come. Groups of red-faced girls stagger arm-in-arm, weaving down the side-walk, enveloped of peals of laughter; to the right, a young couple are flat-out unconscious (Is she aspirating?) on a square of concrete by a vending machine; another girl sits on the curb, hair held back by a friend, vomiting into the gutter. Then you see the line. There is always a line at Ban. Ban Izakaya’s claim to fame is that they created the “Lemon Sour” – a mix of shochu, lemon and soda water that is one of the top Japanese tipples. The restaurant has become so popular that it opened another branch right next door — 2 Bans for the price of one. When you finally open the door you are greeted with a pungent blast of alcohol. It is thick, you can almost taste it. The room is packed, brightly lit and every table is crowded. The walls are covered with hand written signs and wooden slats detailing menu items, specials and drink offerings. Cigarette smoke hangs heavy. There is a cacophony of screams, laughter, jokes being told, plates crashing, toasts. We (three old guys, 2 of us white, one Japanese) were seated at a shared table, next to a group of six college-aged women, one or two in office outfits. The tables are small, the stools small and rickety. I could not figure where to put my coat without disturbing people, so in between my knees it went. There may be beer, there may be whiskey, but everyone in Ban is drinking Lemon Sours. Accordingly, I was brought a heavy, glass mug filled with ice and half-full of shochu; a whole lemon spilt in half, a bottle of soda water and a lemon squeezer. Juice your lemon, add soda water and get into the flow! Every table builds towers of these lemons, one atop another. Using a spindle of chopsticks, some tables have sky-scrapers, some giant mounds leaned up on the wall. Our table-mates must have had a good thirty lemons in a yellow Tower of Pisa. Ban offers everything — tempura, sashimi, yakitori, cold dishes and hot. We ordered pickles, motsuni (offal stew), squid sashimi, edamame, pig tails with tofu, eringi mushroom tempura; I asked the girls what the grilled meat dish on their plate was. Smiling, they offered some to me saying how delicious it was — pork neck yakitori. We ordered some of that as well. The service is brisk — no time to chat — but fast and attentive. The food, when it came, was just terrific — sweet and smoky, little hints of spice with the pig tails, the tempura free of grease. All of it perfect to eat with one more lemon sour. Before you know it, you are in tune with Ban. When I arrived, I felt conspicuously aged, the elder at the young people’s party; but, whatever self-consciousness I had been washed away in the tickle of shochu. Ban ripples with drunken joy and it is hard not to be carried on that wave. Like the best classic Tokyo Izakayas, you are inspired, by cheap prices, by the noise, by the energy, to order that dish of grilled tripe you spied on your neighbor’s plate; have one more drink, tell one more joke, laugh louder and simply enjoy the people you are with. Whatever stereotypes Westerners have of Japanese — they are quiet; they are introverted; they don’t joke around — crumbles to dust in the boozy confines of Ban. The madness continued to peak. A waiter stumbled and dropped a plate of grilled sausages on someone’s head to great laughter and much apologies. 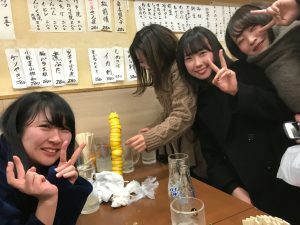 A large group of young men and women, tipped their soaring towers of lemons to the floor as three girls crowded around one shy fellow to take a photo. People slumped on their friend’s shoulders, eyes closed, muscles no longer working. Next to us, the girls were young and happy, drunk, laughing and loud with mobile phones out, snapping photos and texting. They continued to chomp down on serious offal — livers, hearts, guts — until a dis-lodged backpack came crashing onto their table up-ending a bowl of soup. The responsible party (who was just trying to get his jacket off of the narrow shelf) apologized as well as he could. The girls, armed with paper towels, set to work cleaning off their friends and voicing disapproval. The young man quickly handed over 2000 yen ($20) and a copy of his residence card — in case of future dry cleaning bills? Or a seriously wily flirting move? The bathroom line grew and grew until a waiter picked the lock and escorted out a young man who had passed out on the toilet. There was tremendous roar of KAMPEI; some screams, “YABAI!” There wasn’t a fight. There wasn’t a crying girl screaming at her friends. There was no aggressive drunk saying, “What? I’m not GOOD enough to talk to?” In general, while mixed groups were certainly flirting and more, the tables of young men and women kept to themselves — no unwarranted male attention, no meat-market crap so far as I could tell. In a word, Ban is wildly drunken and wildly safe. That sign that is every American bar “Waitstaff will not serve alcohol to visibly intoxicated persons” would be an affront — what is the point of going to Ban without getting drunk? When the bill came — after endless lemon sours (our tower was impressive!) and all that food — it was mysteriously tiny. Less than $47 total. It couldn’t be right, could it? It almost did not make sense. It almost made me proclaim Ban as one of the greatest restaurants in the world…Which, in its chaotic, drunken, off-the-hook sort of way, it just might be. The restaurant of my dreams. Tripe, offal and booze.